The Christmas Holidays are here which means that your kids will be home and ready for some Christmas fun! If you and your family are staying home for the holidays then you’ll probably need to find some fun activities for them so they don’t get bored. If you’re in need of some activity ideas then check out this post about Christmas fun for kids! Piñata – You can have kids make different piñatas in shapes of things related to Christmas. They can make piñatas in the shape of a snowman, Christmas Tree, reindeer, or snowflakes and then have them fill the piñatas with Christmas candy. Christmas Trivia – Make a list of trivia questions for kids to answer. The kid who gets the most answers right can win a prize! Christmas Charades – Play charades like you normally would but make sure it’s a Christmas themed charades game. Snowman Challenge – Give each kid a white piece of paper or a paper plate with a marker or pen of some sort. Then have them place the white paper or paper plate on their head and then using the marker or pen have them draw attempt to draw a snowman. The kid who gets closest to drawing a snowman can win a prize. Candy Cane Hunt – Instead of waiting till Easter to do an Easter egg hunt, have a candy cane hunt instead. Just hide candy canes all over the house and have the kids find as many as they can! Gingerbread House – Get a gingerbread house making kit and have the kids assemble one together. Holiday Movies – If it’s snowing or raining outside you can get all the kids together and put on some Christmas movies! Tree Decorating – If you haven’t already decorated your Christmas tree, having the kids decorating the tree together would be a fun idea! Baking – Have the kids decorate and bake Christmas themed cookies. 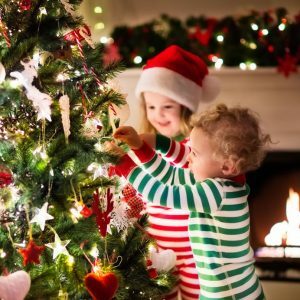 Holiday Ornaments – You can always do arts and crafts with kids and have them create their own ornaments to decorate the Christmas tree with or put up decorations around the house. Hopefully, your kids and maybe even you will enjoy these fun ideas for the Christmas Holidays! Be safe and Happy Holidays!